Seat posts should be easy to adjust, hard to break, and otherwise forgetable. We have a variety of high quality posts to choose from. This is the nicest single bolt seat post on the market. Extremely well polished with top quality machining for the clamp. It's also the best looking seat post available. It's extremely well made, as are all Nitto products. When making adjustments, you can't isolate the fore/aft positioning from the tilt, so it's not as easy to make small adjustments as it is with a two bolt post. But once you do have it adjusted, it won't slip. 250mm, and 420mm lengths available in 27.2mm diameter. Standard setback. The front of the clamp is centered on the post. The Nitto post is made with traditional offfset or setback. The front of the saddle clamp is in line with the axis of the post. You can buy 26.8mm seatposts. But they are all low quality with only a few fixed tilt angle positions for your saddle. You very often can't get exactly the right tilt for your saddle and your rear end. For that you need a true micro-adjust seatpost, with no click-stops limiting the positions of your saddle. There are plenty of seatposts with a true micro-adjusting clamp, but they aren't being sold in 26.8 sizes, except by Nitto. But Nitto will only make these posts if a customer orders a minimum of fifty posts, in each size. You can't order 25 in one size and 25 in another to make a fifty post minimum order, you must order fifty of any given size. For this reason, not a single distributor in the United States has been willing to order these sizes from Nitto, even though there are plenty of good quality frames out there that require these sizes. So, I bit the bullet, and ordered them myself. I now have the Nitto Crystal Fellow, the S-65 post, in the 250mm length, 44mm or 1-¾" clamp width (the industry standard for saddle rail spacing) in 26.8mm. The length is measured from the saddle rails to the bottom of the post. The minimum insertion in your frame is 65mm, clearly marked on the post where it can't be read when installed in your bike. So you can have up to 185mm of post, from the saddle rails to your frame, exposed, and no more. Nitto's workmanship is second to none. These are the most beautifully finished seatposts you'll find anywhere. The quality of these is the same as with the 27.2mm size, which I also brought in. I also brought in the best post Nitto makes. It's the NJ-SP72 Jaguar, a two bolt post with the same gorgeous finish and solid design as the S-65 Crystal Fellow. Nitto now makes it in the 210mm size as well as 250mm, and I have both. 210mm is the old standard for seatposts, back when bicycle frames were sized in the traditional fashion, and riders didn't have their saddle ten inches higher than the handlebar. Why do I say this is Nitto's best post? How is it better than the S-65? By having two bolts to clamp the saddle rails, it's actually easier to make small adjustments to your saddle position. Let's say you have the saddle tilt exactly where you want it, but you want to experiment with moving the saddle forward just a bit. With a single bolt post like the S-65, you loosen that one bolt which allows you to alter both the tilt and the fore-aft saddle position. While you're moving the saddle forward, you might slightly alter the tilt. But with a two bolt clamp, if you loosen just one of the bolts, you can then move your saddle forward, and then, when you tighten that same bolt back up, the saddle will end up at exactly the same tilt it started out at. You'll have made your fore-aft adjustment without changing the tilt one bit. Also, if you just want to adjust the tilt, bring the nose down a bit without changing the fore-aft saddle position, here's what to do. Loosen the rear bolt, and then tighten the front bolt. Your tilt will change, dropping the nose, but otherwise the saddle won't move. Don't worry, you can make adjustments to the S-65 without pulling your hair out. Use a small carpenter's level to see your saddle's tilt, and you can then make adjustments and know that you're only changing one thing at a time. It takes longer with a single bolt post, but it can be done. The Jaguar just makes it a lot easier. Yes, I'm well aware that Nitto makes their seatposts in lots of different lengths and models. These are the only models and lengths that I sell. I cannot order other lengths and models. 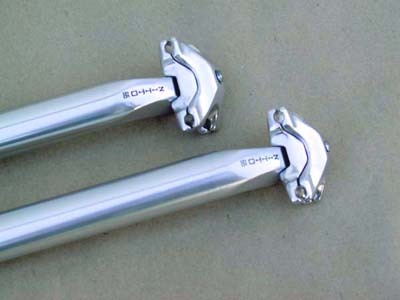 Since I have to order fifty of any one model and size, I cannot special order Nitto posts. 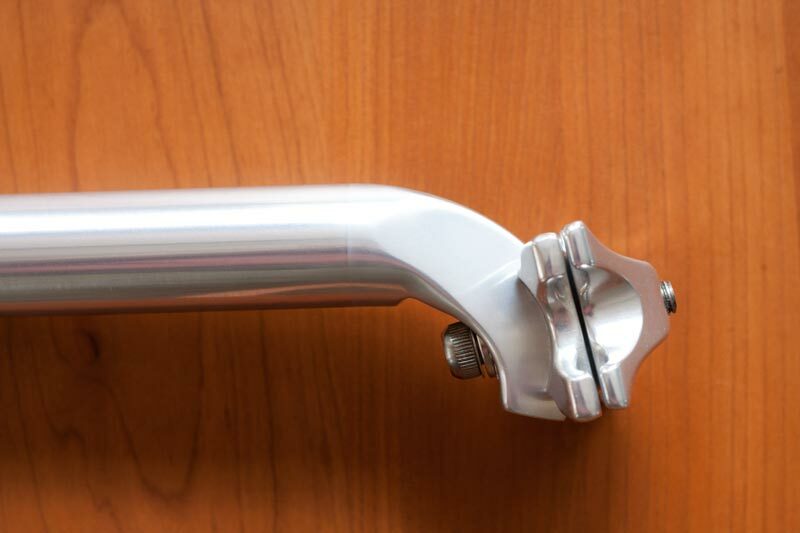 Whatever seat post you use, you can help keep it from being stolen by using a Pitlock seat post binder bolt. Your frame must not have a recessed seat post binder bolt! When you insert the post in your frame, it's likely to be scratched by the inside surface of the seat tube. Put the saddle on the post and check to see that the post will allow adjusting the saddle to the tilt you want before inserting the post in the frame. That way, if the post doesn't work well with your saddle, you can return it. Scratched posts are not returnable. Absolutely no exceptions!